Before you have your first meeting with your reunion planning committee, make sure you have enough people coming to spread the responsibilities. Also, you should have already created and emailed a family reunion meeting agenda so everyone knows what will be discussed. 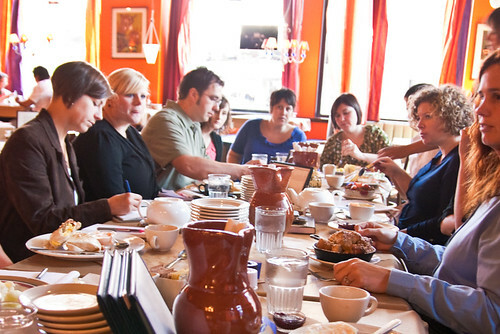 Schedule the meeting in an informal location such as a restaurant so everyone is relaxed. When discussing any topics, make sure to keep the tone friendly and in every case possible, fun. The idea behind the family reunion is to create a great fun filled event for everyone and that starts with the reunion planning committee itself. Following is a list of important points that need to be covered during the first family reunion planning meeting. The first family reunion planning committee meeting should be centered on three key questions. The first being how big the reunion is going to be. The second is where the reunion is going to be. The last question is what time of the year the family reunion is going to occur. Answers to these questions will then determine your course of action and any future steps. In a previous article, we discussed sending out a family reunion survey ahead of the first planning meeting. The results of the survey should narrow the choice of where and what time of year the family reunion should be held. In addition, the survey will also give you a good idea of how many people to expect. The family reunion planning meeting should simply finalize the city and the date that the family reunion will occur. At the conclusion of the meeting, the person who is heading the communications committee should send out a save the date e-mail to everyone advising them of the exact dates, and the city the family reunion is going to occur. Once the above three are finalized you will want to start discussing areas of responsibility for each person on the reunion planning committee. Who is going to set up the registration packets? Will they be sent via e-mail for people to print? Or should you just create a PDF and post it on the website? Who will create the registration packets? Who will compile them and maintain a record of who is coming and whether they have paid or not? Who in the family is good with finances and can help develop a family reunion budget? Is there someone who is a successful business owner or has a management position at work? If so, does this person have the time to devote to creating, maintaining, and updating the budget. This person will also be responsible for opening up and maintaining a bank account, paying bills, reimbursing expenses, maintaining records of petty cash, and any other responsibilities related to the inflow or outflow of funds. Read more about what the family reunion finance committee does. Does anyone have experience blocking hotel rooms for a family reunions? Are there websites where you can get group rates for hotels? What are we looking for in a hotel? Will we need banquet space at the hotel or a pool? Do we need a hospitality suite for the family so we can get together? Answers to the above questions are here in case you’re wondering. Is anybody in the family familiar with caterers or has worked in a restaurant? You’ll need someone who is able to decide on a menu, negotiating pricing, and has the time to do the research required. In order to get them started, the catering committee will need to know the budget per person, the number of people expected to attend, buffet style or plated, and a rough idea of the location of the event. Once they have the answers to these questions, the catering committee can contact area caterers, restaurants, and banquet houses for quotes and to conduct taste tests. Here is a list of responsibilities for the family reunion catering committee. The position requires lots of taste testing so dieters beware. Is there a need to block rooms at a hotel? If so, will the hotel provide complimentary transportation to and from the airport, bus and train stations? Will we need additional transportation to any group events that we may be planning. If so, how big a bus will we need? Get a volunteer who can research the different transportation options and get quotes from multiple providers so a decision can be made. What kind of entertainment will the family like? Should you have a theme at the family reunion? Should we have separate entertainment for adults and kids? A clown or magic show is a popular option for kids as is the hotel pool. Adult entertainment can be anything from a Broadway show to a dinner and dance. This committee should also be responsible for setting up a theme for the family reunion. WIll it be a tropical Hawaiian theme or one that plays on the family heritage? The entertainment and activities selected can also be tied into the general theme of the entire family reunion. Need some unique themes for a family reunion? How many people do we need to be part of the set up/cleanup crew? Maybe we should require that each household have one person volunteer to help at the reunion? What are the responsibilities for the set up/clean up crew? Do we have a set-up/cleanup checklist? If there are a lot of kids, have every family bring one board game? If there are going to be activities for adults, who will be responsible for taking care of the kids? What kind of activities will the adults enjoy? What kind of a budget should we have for entertainment? Download a list of responsibilities for the family reunion activities committee. After you have selected individuals to lead each committee, go over the expectations of what needs to be done. List individual responsibilities for each committee so everyone understands what is expected of them. If you need help with the responsibilities of each committee, click here. Each reunion committee head is responsible for keeping the family reunion chairperson up to date on their progress. If they are falling behind, they should ask for help earlier than later. Each reunion committee leader is also responsible for recruiting volunteers for getting their work done. Before you conclude, set a date for the second family reunion planning meeting.